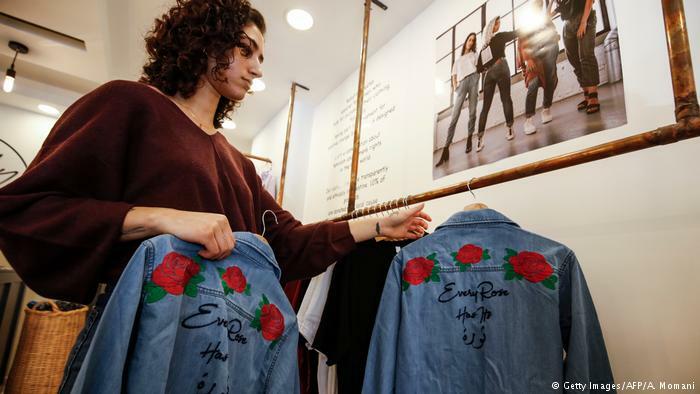 Palestinian fashion designer Yasmeen Mjalli speaks while standing in her clothing shop where her label collection “BabyFist” carrying anti-sexual harassment slogans is showcased, in Ramallah in the occupied West Bank on December 19, 2018. Palestinian fashion designer Yasmeen Mjalli (R) arranges clothes in her shop where her label collection “BabyFist” carrying anti-sexual harassment slogans is showcased as her creative director Amira Khader (L) stands by, in Ramallah in the occupied West Bank on December 19, 2018. 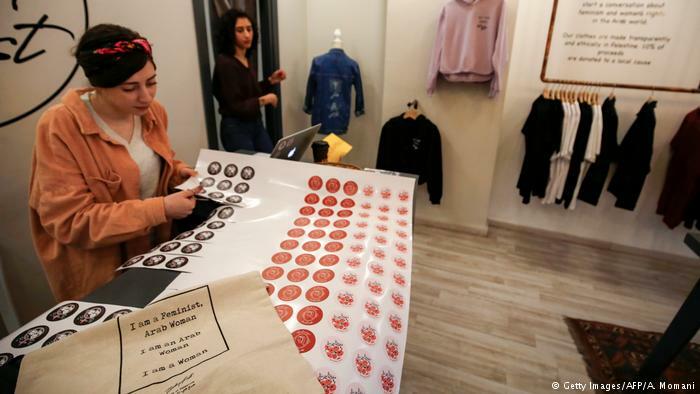 Amira Khader (L), Palestinian creative director of the feminist fashion label “BabyFist”, cuts stickers while founder Yasmeen Mjalli stands next to her in their shop in Ramallah in the occupied West Bank on December 19, 2018. 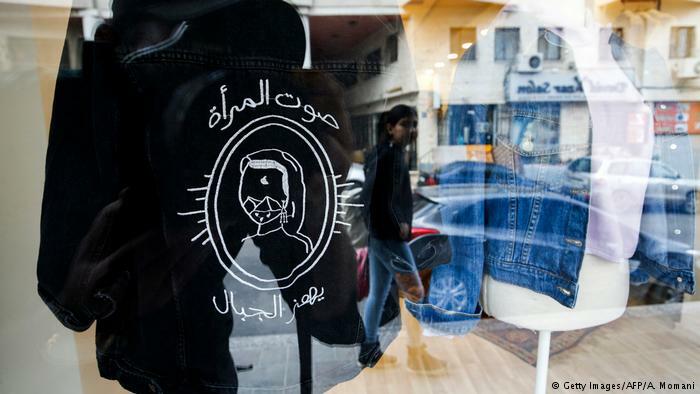 Among the sewing machines humming under florescent lights, Shehada shows a denim jacket embroidered with “Not your habibti”. “I am proud that women wear the fruits of my labours and I am also very proud that they are labelled ‘Made in Palestine’,” he says. 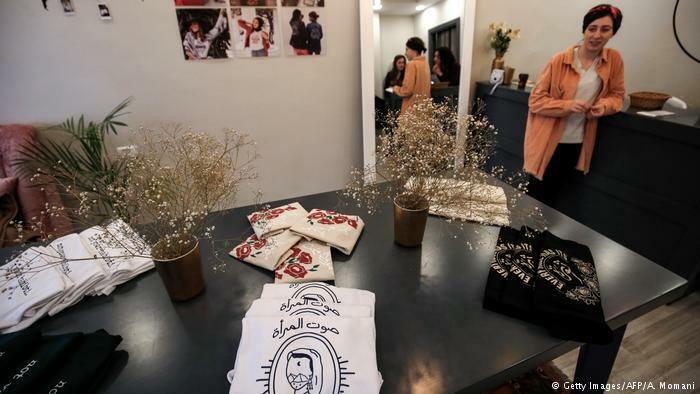 This picture taken on December 19, 2018 shows clothing from the Palestinian feminist fashion label “BabyFist” on display at a shop in Ramallah in the occupied West Bank. 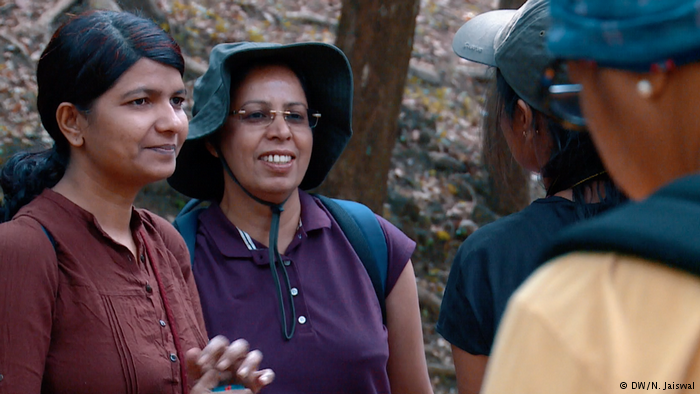 The slogan reads in Arabic, “a woman’s voice shakes mountains”.